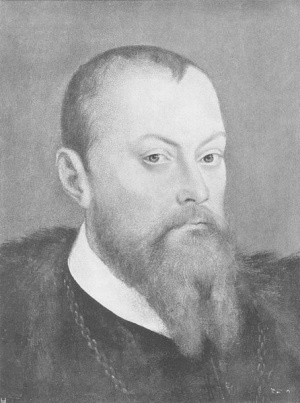 Maurice (Moritz von Sachsen), Duke, 1541-1553 and later Elector of Saxony, 1547-1553, was born 21 March 1521, the son of Duke Heinrich IV the Pious, who introduced the Reformation in Albertine Saxony, and Katharina of Mecklenburg-Schwerin (d. 1561). He succeeded his father to the duchy in 1541, attained to the electorship after the Schmalkaldian War, in which he fought on the emperor's side in spite of his sympathetic interest in the reformers, then deserted the emperor, compelled the signing of the treaty of Passau of 1552, and died in 1553 of a wound received in the victorious battle of Sievershausen, "a man of cool political calculation and full of religious indifference." When Maurice assumed the government in 1541 at the age of 20 years, there were in the duchy some isolated Anabaptists, in spite of the bloody persecution under his father's brother and predecessor, the strictly Catholic Duke Georg, Duke of Saxony from 1500 to 1539. At the end of July 1543 two women and a man were seized in Beyernaumburg, a village east of Sangerhausen, where Anabaptists had been imprisoned earlier, and were ordered by the duke to be cross-examined by the preachers of Beyernaumburg, Kaltenborn, and Nienstedt. Further information concerning them is unfortunately missing. In Mühlhausen in Thuringia, which was jointly ruled by Maurice and the landgrave of Hesse, he ordered the violent extermination of Anabaptists in 1545, but was unable to overcome the tolerant attitude of Philipp of Hesse, his father-in-law. And so the Anabaptist leader Christoph von der Eichen was permitted to leave the country with his wife and child, though his return to Mühlhausen was forbidden on penalty of death. On the whole, there were hardly any heresy trials under Maurice; matters of faith played a subordinate role in his politics. Maurice died 9 July 1553. The final eradication of the Anabaptist movement in Saxony was reserved for his less gifted brother and successor, the strictly Lutheran Augustus (1526-1586). Hege, Christian and Christian Neff. Mennonitisches Lexikon, 4 vols. Frankfurt & Weierhof: Hege; Karlsruhe: Schneider, 1913-1967: v. III, 167 f.
Wappler, P. Die Stellung Kursachsens und des Land-grafen Philipp von Hessen air Tauferbewegung. Münster, 1910. Wappler, P. Die Tauferbewegung in Thuringen von 1526-1584. Jena, 1913. Hein, Gerhard. "Maurice, Elector of Saxony (1521-1553)." Global Anabaptist Mennonite Encyclopedia Online. 1957. Web. 24 Apr 2019. http://gameo.org/index.php?title=Maurice,_Elector_of_Saxony_(1521-1553)&oldid=145793. Hein, Gerhard. (1957). Maurice, Elector of Saxony (1521-1553). Global Anabaptist Mennonite Encyclopedia Online. Retrieved 24 April 2019, from http://gameo.org/index.php?title=Maurice,_Elector_of_Saxony_(1521-1553)&oldid=145793. Adapted by permission of Herald Press, Harrisonburg, Virginia, from Mennonite Encyclopedia, Vol. 3, pp. 542-543. All rights reserved. This page was last modified on 16 January 2017, at 00:51.